Parents have been sharing positive feedback about the Lent bags, prayer cubes, beach ball prayers and other materials we have sent home to encourage families to practice faith throughout the week. 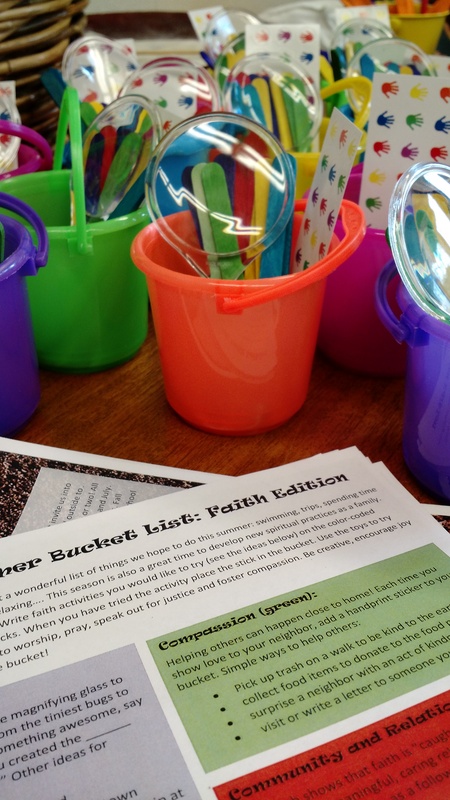 Building on our recent visit from the Flat Wesleys, I designed a fun, summer-themed, faith kit to inspire Acts of Piety (worship and devotion) and Acts of Mercy (justice and compassion). We will provide one per household. They are targeted to families with elementary age children. However, I think other ages might enjoy them, too. (Who doesn’t like bubbles?) I made a few extras for grandparents to share with their grandkids who live out of town and anyone else who might like one. Each kit cost about $3 to make. Feel free to adapt the instructions to your setting as long as you include a brief acknowledgment or link to the source (www.blesseachone.wordpress.com). Thank you and blessings on your summer journey! You are too sweet. I’ll let you know what kind of feedback I get at the end of summer. LOL, I do have a pinterest-y side I often keep hidden.